Fifty years after her untimely death, Let Me Tell You is a new reminder of just how excellent a writer Shirley Jackson was. The stories, essays, and lectures in this sparkling new collection include some previously published and some available to the public for the first time. Thirty short stories, 16 essays and reviews (including five on the craft of writing), and 10 musings on humor and family fit into five sections. Aptly titled, these include “Sudden and Unusual Things Have Happened,” “I Would Rather Write Than Do Anything Else,” and “I’d Like to See You Get Out of That Sentence.” Let Me Tell You was edited by her children, Laurence Jackson Hyman and Sarah Hyman DeWitt, who spent a number of years sifting through and bringing some semblance of order to her archives in the Library of Congress. Ruth Franklin, whose biography of Jackson will debut in 2016, provides a foreword. Rest assured that “shudder-producing” stories are here. The “Good Old House” features ghostly events in an old house just inhabited by new owners with whom no one will visit. In real life Jackson famously said that no house should be burdened with children and poltergeists. Its gentle fright is counterbalanced by “Paranoia” which reminds us that occasionally someone really is after us. Mr. Beresford heads home with a box of candy to begin celebrating his wife’s birthday. He encounters a “man in a light hat” who seems to take offense at him. Whether he travels by bus, taxi, or subway, the man is menacingly there. He arrives home safely but the story does not end there. In “A Garland of Garlands,” Jackson features a book reviewer who does not have time to read so he asks his wife to read the 900-page book overnight so he can ask her what she thinks. Of course, he takes her thoughts and uses them to write his review. The irony is that she wishes she could write as well as he does. It is a subtle, but effective, commentary on the perceived place of women in her lifetime. Jackson takes us into her life. “Private Showing” relates how she came to view and her family’s reaction to the movie “Lizzie,” based on her novel The Bird’s Nest. More self-deprecating humor arrives in “She Says the Damnedest Things.” A brief, 250 words or so, this clearly autobiographical story is about an unknowing girl who will chatter on about nothing and wants to be a writer. Jackson’s ruminations on writing are of particular interest. She tells us in “How I Write” that she made up stories as she worked around the house. Her most famous story, “The Lottery,” came about after she had read a book about choosing a victim for a sacrifice. As she went grocery shopping the next day, pushing her child in the stroller, she began wondering who in her small town would be a good choice. In her lecture “Garlic in Fiction,” she said that it is “the writer’s job to reach out and grab this reader” even if the reader might not like the genre. Use all the literary devices at your disposal, especially those that “separate fiction from reporting, the work of the imagination from the everyday account.” Just as a small bit of garlic can color a dish, a small detail can bring even a peripheral character vividly to life. She then provided specific information on why she included certain symbols in The Haunting of Hill House which she had just finished. 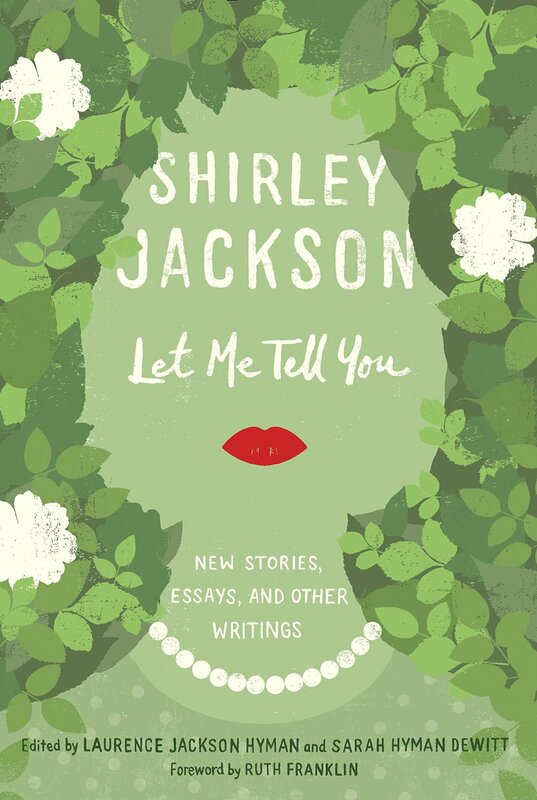 Let Me Tell You provides a wonderful introduction to Shirley Jackson for younger readers, and an equally delightful reminder for certain readers among us who remember why we enjoyed her so long ago. Humor and terror combine to create unforgettable stories that grab the reader’s attention. Readers have an instructive and entertaining collection of stories that remain as contemporary as the days they were written.